Nothing so reveals the character of the men on the commanding heights of the Russian economy than a lawsuit in an international court initiated by their wives against one of their tradesmen. In the case which recently came to light, Aleksandra Melnichenko (nee Nikolic), wife of the fertilizer oligarch Andrei Melnichenko, sued a New York art dealer for more than €5 million, including triple punitive damages, for putting the wrong thing in her garden. This beats the record for a backyard claim previously set in a Washington, DC, court by Elena Pinchuk – daughter of the ex-President of Ukraine, Leonid Kuchma, and current wife of Victor Pinchuk. The New York case turned on Mrs Melnichenko’s claim that she had ordered her sculpture to be 220 centimetres in height, but she got only 120 centimetres. The missing 100 centimetres, she claimed, was not only an aesthetic violation and a lapse of taste, but also a breach of contract, and worse, a case of fraud. Hence the triple damages. Igor Mitoraj, 68 years old, is a sculptor of Polish and French extraction, who works at a studio in Carrara, the home of classic statuary marble in Italy. According to one of his resumes, it was in 1979 that he visited Carrara and decided “that marble is the perfect material for his sculpture.” Mitoraj produces his pieces in the style of the ancient Greeks and Romans. He adds the appearance of antiquity too — green patina (cupric nitrate) to the copper and bronze, pockmarks to the marble. The works are also presented in an apparently broken condition, as if the Huns had ridden by, knocking them off their pedestals. According to the ArtNet catalogue of the 321 works Mitoraj has sold, not one is a composition like the one Mr and Mrs Melnichenko commissioned for the garden of their summer house “in or about September 2008”. One which comes close is an antique head of Eros, wearing bandages which don’t cover his eyes or close his mouth. 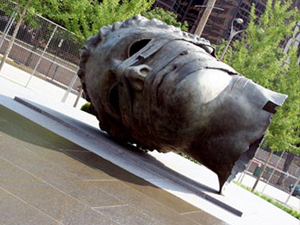 This is lying down on the corner of 8th and Market Streets in St. Louis, Missouri. The local media claim the work is bizarre but popular. The nearest thing to the pair of heads the Melnichenkos commissioned from Mitoraj is currently for sale at a German gallery called Die Galerie in Frankfurt. The gallery says its two-headed piece in bronze, with patina added, is called Hermanos (image, upper right). Mitoraj has been showing this at exhibitions for about four years without takers; most recently this year it’s been in Berlin The vertical height is 293 cms. The asking price is €1.6 million. The gallery says it is also selling a smaller version with a vertical height of 99 cms. It’s going for €295,000. Mitoraj says he commutes between his studio in Carrara and an apartment in Paris. According to a gallery there, Galerie Agnes Monplaisir, he’s dropped off an item for sale called Dormiente (“Asleep” – image lower left). Made of pink-veined marble, it’s 33.5 cms in height. The asking price, says Madame Monplaisir (“My Pleasure”), is €260,000. Never been owned, no pockmarks. It appears that Mitoraj gets costlier as he chisels upwards. The micro Hermanos is €2,980 per vertical centimetre; the macro, €5,461 per vertical centimetre. But stone is pricier by far than metal. Even though the marble used for Dormiente came from Portugal, not from Carrara, it weighs in at €7,621 per cm. The peculiarly vague phrase – “in or about September 2008”. — appears in the legal papers filed in the US District Court of the Southern District of New York (Manhattan) by the Melnichenkos’ lawyer, Patrick Salisbury. It is his participation in the case which unexpectedly brought the records to light. The New York court was chosen because the dealer whom the Melnichenkos blamed for shorting their sculpture, then doubling its price, is based at an address in Manhattan. The dealer’s name is David Benrimon; his company is called David Benrimon Fine Art (DBFA). According to the court papers filed in his defence, starting in the summer of 2008 he traded “in excess of $26 million” worth of art to the Melnichenkos, not all of it in their backyard. The batch intended for the garden was ordered in September 2008, and the payment up front came to €3 million. Delivery followed in 2009. After the crates were unpacked the two-headed piece (image top left), called Sonno Grande – that’s Italian for “a great night’s sleep”, and more — turned out to be “approximately half the size…which HAL contracted and paid for.” According to the Salisbury statement of claim, €500,000 had been paid but the result was 100 cms less grande than it should have been. Mrs Melnichenko’s role in the affair, along with her husband’s, are revealed in Benrimon’s defence. But according to Salisbury’s statement of claim, there is no trace of them. Instead, he is acting for a company called Hamilton Art Limited (HAL), which is registered at an address on the Isle of Man. Another Hamilton-named company, registered in Bermuda, appears to own the Melnichenko aeroplane. The same underling, George Cardona, represents the Melnichenko interest on the boards of both companies, along with sixteen other, related companies. Oops, Benrimon replied. Salisbury, HAL and the Melnichenkos told the court that in an email of October 2009 Benrimon and his dealership admitted “they had delivered the wrong sculpture.” They also promised to “acquire the correct Sonno Grande from the artist and deliver it to HAL.” Benrimon reportedly said Moraj hadn’t made it yet, and would take a year to do so. But that’s where the marble apparently got rubbed the wrong way, Mitoraj jacked up his price for the extra, grander hundred centimetres. Instead of €500,000 for 120 cms, or €4,166.66 per centimetre, he demanded at least €1.2 million for 220 cms; that’s €5,454.55 per centimetre. The premium was 31%. Apparently the artist wasn’t sure how much sleep he would lose over the extra work, or how much he thought the Melnichenkos could spring for, so a price of €1.8 million was also mentioned. That’s €8,182 per centimetre. Almost double the amount already priced into the goods. According to the court papers, the Melnichenkos were over a barrel. 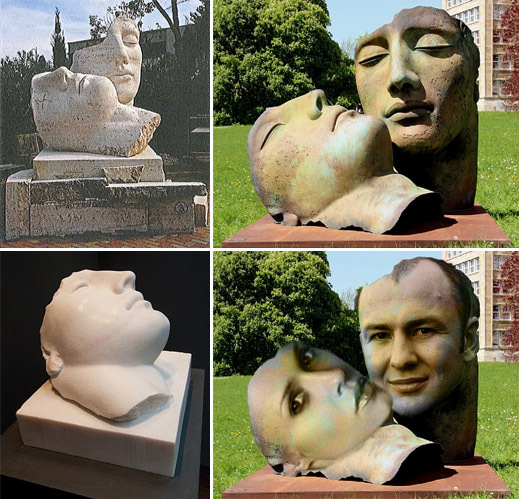 Mrs Melnichenko had told Benrimon, according to the statement of the latter’s lawyer, that “she was unhappy with the size of the Sonno Grande sculpture as delivered.” Benrimon’s lawyer also revealed in court that Sonno Grande was unveiled in Mrs Melnichenko’s backyard on July 15, 2009. But she didn’t decide it was too small for at least two months. Again according to Benrimon’s defence statement, an invoice dated September 25, 2008, from Benrimon to the Melnichenkos, was accepted and paid up in full — €3 million. The invoice included Sonno Grande-120, the exact model Mrs Melnichenko had been looking at between July and September 2009. What happened in the garden over those heated months to upset Mrs Melnichenko’s Sonno? What caused her Grande to shrink? The case started on September 8, 2011. That’s two years after Mrs Melnichenko’s garden lost its Big Sleep. More time was expended on expensive preliminaries and hundreds of pages of court records. But the claims and the evidence were never tried in the New York court. Instead, the two sides agreed on an out-of-court settlement on March 14, 2012. Apart from Salisbury’s say-so on behalf of HAL and the Melnichenkos, the only piece of evidence presented to the court was Exhibit 1, a picture of Sonno Grande. In the court papers, this is described by the lawyer as a “prototype”. It isn’t revealed whether this is Sonno Grande-Mini, or Sonno Grande-Maxi. The numeral 3 on the right corner of the pedestal may be the artists’s mark; or it may indicate how many Sonnos there are, or used to be. There is no record in the court file of what the Melnichenkos call their September 2008 contract with Benrimon. The invoice of September 25, 2008, with Sonno Grande on the itemization, is also missing. Not a single statement of account for the $26 million flow of Benrimon goods to the Melnichenkos has been documented in the public record. But if true, the record suggests that after waking up from six weeks of looking at Sonno Grande, Mrs Melnichenko spent the next two and half years suing for fraud while buying more goods from the same dealer at the same time. She may have spent more money on Salisbury the lawyer than on Sonno Grande. As New York lawyers go, Salisbury isn’t exactly grande himself. Just five lawyers are listed at his Manhattan office address. Salisbury describes himself as a specialist on arbitration in “complex commercial disputes, generally involving matters with cross-border aspects and international parties…Our philosophy is to provide sophisticated, but practical, legal advice to corporate clients and assist them in achieving their goals in an expeditious and efficient manner.” Because the settlement terms are secret, it isn’t possible to calculate whether Salisbury’s advice cost more than Mitoraj’s first sculpture; whether the second one has ended up in the garden; and whether the entire affair was a losing proposition for the Melnichenkos. Big Sleep won or lost, Salisbury continues to be Andrei Melnichenko’s lawyer in the $800 million battle over Eurochem’s ill-fated Gremyachinksoye potash mine in Volgograd. That is in arbitration proceedings under way in Zurich and Paris, and also in litigation in Amsterdam. A spokesman for Salisbury, Ester Rosado, confirms he has received emailed questions asking why the text of the agreement Mrs Melnichenko’s claim relied on was not in the court record. Rosado said Salisbury wouldn’t be available to take a call. He refused to answer the email. The Benrimon defence lawyer was Darlene Fairman of Herrick Feinstein; with 158 lawyers, it’s a grander firm than Salisbury’s. The firm website reports it specializes in art law and it has had more than passing involvement with Russians. Fairman says she was one of the lawyers who successfully recovered works by Kazimir Malevich which had been sold fraudulently. The pursuit of the Malevichs started in the 1970s, when the Soviet Ministry of Culture was acting on behalf of Malevich heirs then living in the USSR. Fairman refuses to respond to questions about the court record in the Melnichenko claim, or about the missing contract and invoice. No doubt then, according to the defence, that Mrs Melnichenko got what she asked for. Only afterwards she changed her mind. Also, Mitoraj the sculptor got a wake-up call of his own. This time round the Melnichenkos opted not to let Koeltl decide. In more respects than picking sculptures for her yard, Mrs Melnichenko is patronising in the most expert way. When it came to fitting out her yacht, she says: “I was included in every step of the interior design… My personal style is minimalist or totally over-the-top. I hate anything in the middle.” According to the court papers, Benrimon also sold artworks which have been installed on the boat. Privacy and confidentiality note: lawyers for both sides refuse to identify the country in which the Melnichenko garden is located. They will neither confirm nor deny that it is Montenegro, claiming there are confidentiality and privacy issues. The Melnichenkos guard their privacy zealously. 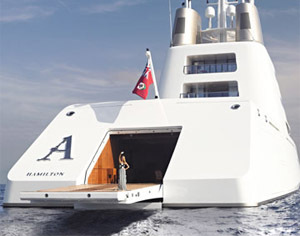 According to this report from the Wall Street Journal, the entrance-door to their bedroom on board their motor yacht can only be opened by putting your finger in the lock: between 4 and 5 fingers reportedly qualify. It isn’t clear whether the special “nookie” bedroom, uncovered on board by the Wall Street Journal, has hidden cameras pointing outward for extra security, or inward for the delectation of others.